Obituary – Treeman, John Lawrence « Perry High School Alumni Association, Inc.
John Lawrence Treeman, a lifelong resident of Perry, Oklahoma passed into his next life at the Oklahoma Veteran Center in Claremore on April 12, 2014. He was 92 years old. John was born in Perry to Ralph W. and Irene McCune Treeman on May 16, 1921. Both of his grandfathers were pioneers, making the run to Perry in 1893. He was one of four siblings. His oldest sister, Elizabeth Treeman Willems deceased was active in Perry. His older brother Bill spent a number of years in Sapulpa and now resides in the Claremore VA Center. His youngest sister, Frances Hoch, was a long time resident of Oklahoma City and now resides in Fort Worth, Texas. 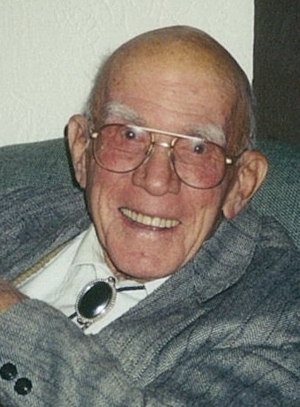 John attended school in Perry, graduating from Perry High School with the class of 1940. He was active in the FFA, where he developed a love for raising livestock. John joined the United States Army, serving stateside during World War II. His primary duties included protecting U.S. airfields. After his discharge from the Army, John returned to Perry to continue his farming activities. He was a member of the First Presbyterian Church, where he served as a deacon for a number of years. John lived modestly, never marrying. He was a kind hearted gentleman who loved family gatherings, often hosting family members at his farms for a wide range of outdoors activities. He spent most of his days raising cattle on his farm. He always enjoyed horse riding and helping his nieces and nephews engage in these activities.